Ever wonder if what you are doing is making a difference? This is an overwhelming, heavy question for us as we encounter roadblocks and challenges in our life. It is amazing to me how often we refer to this question when it requires so much of our heart, soul and mind to process. Typically, this question comes to mind when we are tired and experiencing failure so our filter is a little dirty to truly process the answer. Joyce Meyer was sharing on a podcast recently that when people ask her “aren’t you tired from all that travel and speaking?”, she responds, “I don’t know if I am tired because I don’t ever ask myself those types of questions.” She stays focus on the reason she started and what sustains her along the journey. A great way to protect yourself from asking and answering this heavy duty question “am I making a difference?” is to “frame your day”. What do the first 2 hours and the last hour look like in your life? When you frame your day for success, you are able to filter much faster the emotions that can derail us. Deep down inside, we all want to be a champion. We want some level of success and enjoyment of life. Perhaps just a tweak in your thinking will send you soaring into arenas of life you never thought possible. Have you considered being a champion for someone else? Who are you encouraging today? Whose cup needs filling? I love what Zig Ziglar says, “when you help enough other people get what they want, you will get what you want.” This takes a lot more strength and focus than you would imagine. Eleanor Roosevelt said, “do the thing you think you cannot do”. Strength does not come from doing things you can do; it comes from doing things you think you can’t do. Our lives are renewed when we renew others. You never know what is on the other side of more phone call, text message, note card written or coffee chat. Each day is another opportunity to pick up the shovel and dig just a little more. We are literally cultivating relationships as we layer pieces of communication. Some days we hear from others how what we did impacted their lives. Other days are silent. Our mailboxes are empty, yet we are dropping lots of messages to others, writing notes and leaving messages by voicemail. When you frame your day, you are renewing your mind as you meditate and pray. You are writing your affirmations of who you are becoming. It is a time of creating the framework for your day. The cultivation process lies within the framework. As your day comes to a close, you reflect on your blessings so you can wake up to the possibilities the next day. 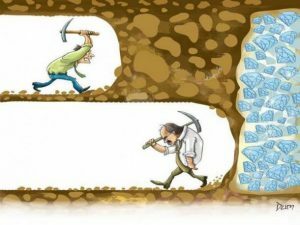 Keep digging…keep searching…keep encouraging…your breakthrough is closer than you think. Until next Friday . . .